The opponent frontally followed the retreating Panzergruppe, which moved in north-westerly direction. Most forward elements stood on the line Hacheim – Acroma. According to radio interception, 4 Indian Division (until now with 30 Corps) was subordinated to 13 Corps. 2 South African Division with subordinated 1 Army Tank Brigade appears to concentrate for an attack against the Bardia-, Sollum-, and Halfaya-Front from the west. The enemy follows Panzergruppe, which retreats in a northwesterly direction from the area B. el Gubi on both sides of the Trigh el Abd. Radio reconnaissance recognised 4 Indian (inserted: Division) (22 Guards Brigade and 11 Indian Brigade) and 4 Armoured Brigade here. The presence of 7 Rifle Brigade in the area south el Adem has not been confirmed. This brigade must now be presumed in the area west of B. el Gubi. Stronger reconnaissance forces pushed south B. el Gubi towards Hacheim. No significant enemy movements were recognised further south. The opponent in Tobruk kept quiet. No enemy movements were noted in the area Gialo – Giarabub – B. Ben Gania. Enemy forces followed up from the area east and south-east el Adem (probably 1 South African and 7 Rifle Brigade) and the area around B. el Gubi (11 Indian, 22 Guards Brigade, 4 Armoured Brigade). Air reconnaissance noted large conglomerations of motor vehicles in the area of Tobruk. 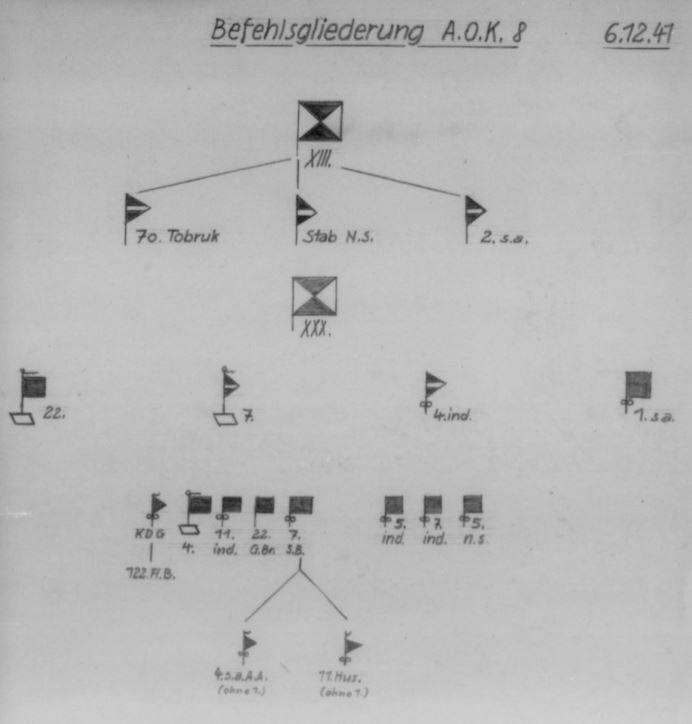 Line B. el Gubi – Hacheim – Tengeder thus far only weak enemy reconnaissance forces. An enemy focus at Tobruk (inserted: and around) B. el Gubi is recognisable. Enemy forces in the area B. el Gubi were further reinforced. For example, 22 Armoured Brigade was recognised there, which apparently at least partially has been rebuilt. The attack planned by D.A.K. together with Corps Gambara [italian mobile corps] did not happen, since the latter corps did not arrive on time. The report below was signed off on 2 December, and sent off at 09.55 hours of the same day. 7 Armoured Division continued its attacks to relieve 2 New Zealand Division between B. el Chleta and S. Rezegh with 7 Rifle Division, 1 South African Brigade, and 4 Armoured Brigade. Repulsing the attacks and the destruction of the mass of the New Zealand Division were successful. Only elements could escape southeast, where they were taken in by 1 South African Brigade. Both formations have disengaged and are probablying situated in the area B. Taieb el Esem.7 Rifle Brigade which primarily attacked with its artillery into the rear of the 21 Panzer Division retreated into the area B. bu Meliha during the evening. Around 15.00 hours the Command of 8th Army ordered the following line of resistance for 7 Armoured Division: Sherferzen – B. Taieb el Esem – 13km south B. el Gubi. 7 and 22 Armoured Brigades did not enter combat. 11 Hussars were ascertained during the afternoon, advancing west of B. el Hacheim on Ain el Gazala. The Luftwaffe attacked this battalion with good results. KDG and 4 South African Reconnaissance Battalion did not appear. The motorised elements of 7 Indian Brigade situated west of Bardia undertook harassment operations there. According to reports gathered until now, from 18 November to 1 December 814 tanks and armoured cars were destroyed and 127 planes shot down. The large volume of booty cannot be assessed at this time. The number of POW has risen above 9,000. Command 8 Army did not succeed in relieving 2 New Zealand Division. It has to be expected that on 2 December no sizeable attack will be carried out towards Tobruk, rather that the mass of the British formations will reorganise and reinforce in the area B. el Gubi, while at the same time attempting to undertake harassment operations around Ain el Gazala and Bardia. Enemy behaves in a very careful manner versus the D.A.K. which advances on B. el Gubi. The enemy elements assigned north and north-west of B. el Gubi evaded in the area south and south-east of it. There are now presumed to be 22 Guards Brigade, 11 Indian Brigade, and 4 Armoured Brigade. During the afternoon, based on radio interception, 1 South African Brigade was brought up to the area northeast B. el Gubi. Furthermore the command staff of 4 Indian Division was recognised. The lifting of the siege of Tobruk in the south-eastern sector has apparently not been recognised by the English. During the afternoon 5 British transport vessels were noted outside Tobruk. The picture below shows the suspected OOB of 8th Army on 6 December. Because of heavy enemy pressure from Tobruk via Ed Duda towards the south, the southeast front had to be abandoned. The D.A.K., advancing from the area west of El Adem towards B. el Gubi, encountered during the afternoon hard west of it the 11 Indian Brigade. In this area also 22 Guards Brigade and 4 Armoured Brigade have to be expected. Air reconnaissance noted numerous enemy vehicle columns from the south-east advancing towards the Trigh el Abd. Another weaker enemy movement was recognised from the area S. Omar to S. Azeiz. 1,000 vehicles at 15.00 hours driving west on the track railhead – Sherferzen. Apart from supplies new formations are being brought up from the Western Desert.